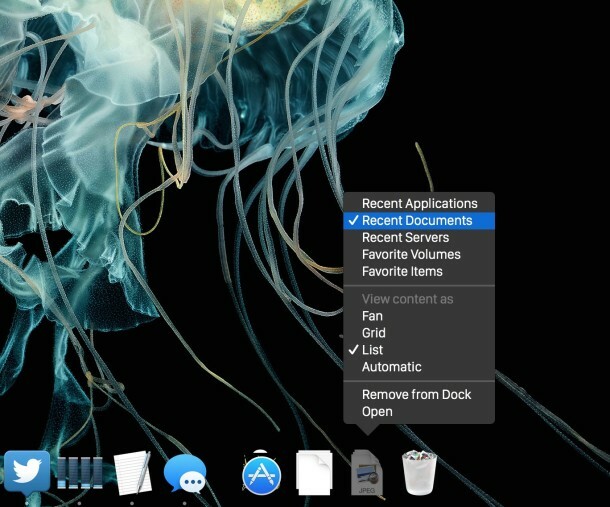 You can add a Recent Items menu Stack to the Mac OS X Dock by using a defaults write command. The default is set to “Recent Applications” but once the Dock item exists you can adjust it to feature other recent items too, like Recent Files, Recent Items, Recent Servers. This is a neat feature that works in all versions of Mac OS X, so let’s show you how to enable it with a defaults string from the command line. Launch the terminal found in /Applications/Utilities/ to get started. That needs to all be on a single line, so if you copy and paste it make sure the command is one string. Hit enter to execute the command. Now right-click on the newly appeared ‘Recent Applications’ Dock item, it will have appeared next to the Trash icon. You can change this to be Recent Applications, Recent Documents, Recent Servers, Favorite Volumes, or Favorite Items. If you want more than one, just run the command again at the Terminal. This menu item will stick around in the Dock as long as you want it to. If you want to remove the Recent Items menu, just drag it out of your Dock like any other Dock item in Mac OS X.
Neat huh? Thanks to Sean for the submission, if you know of any other cool tricks or defaults commands, be sure to let us know! And what would one do to remove it? Just drag it out of the dock? That’s nice but it doesn’t work. I just copied the code and it’s only one line. this was awesome. The only thing I wish I could do was have both recent apps and recent documents in the same folder. otherwise it would be sweet, but I just did the terminal thing twice so I have one of each. Thank you. This seems to work for me, in that I get the dock icon, but nothing gets added to it, seemingly. How often does it update? Do I need to restart? how to display as dictionary and not stack? Excellent. The Apple Menu > Recent Items list is useless because it isn’t in reverse chronological order. This is in the proper order and is one less mouse click. Cool. Can you do the same for the recent folders list? Fantastic, thanks for sharing this . Makes my life so much easier! Works on OS X El Capitan 10.11.3. Thanks! Wow this is great. It works in macOS Sierra Version 10.12 Beta too.